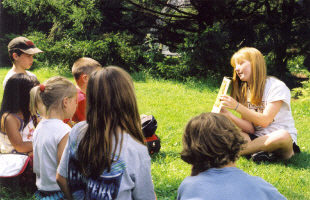 Day Camp activities include Natural History, Ecology, Hiking, Canoeing, Kayaking, Art, Camp Craft, Animal Tracking, Map & Compass Orienteering, Gardening, and Swimming. Each day of camp within a week has a different focus. The individual weeks, however, do not differ. We hike a lot but plan our hikes to be easy at the start of each week. Each day's activities alternate between physically "active" and "restive". Parents tell us that their children come home happy and sleep soundly after each day of camp! Summer is the perfect time of the year for young people to learn many of the elements of gardening. From building healthy soils, to planting and nurturing young plants, to harvesting tasty and nutritious food items, campers will spend the week learning about and practicing good gardening techniques. Campers will have the opportunity to design a unique garden area that will complement their plantings. Projects include measuring and staking rows and beds, building a simple attractive fence and making special features, such as a trellis or bench. The benefits of the garden extend well beyond its edge. Many butterflies and birds may be attracted to a garden for feeding and nesting. 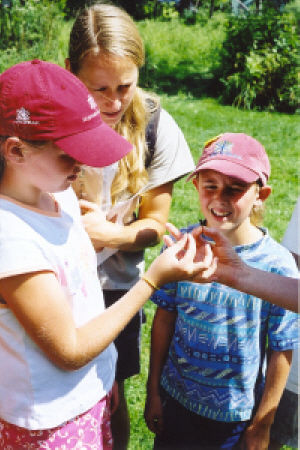 Wildlife, people and the garden are set in a greater landscape - a natural garden - that provides many opportunities for campers to learn about the ecology of meadow and forest. The steps taken in the garden are limitless and may guide one to gardening for life. The week will include regular camp activities as well - hiking, swimming, making new friends and having fun. Nature is a basic source of inspiration for art. Campers are encouraged to see and appreciate the natural world around them and to learn creative ways to portray what they see and feel through a weeklong series of art projects. 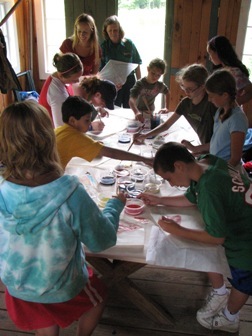 Campers will learn some basic art techniques using a variety of traditional media: pencil, charcoal, pen and ink, watercolor, Cray-pas and acrylic paint. Each day will have the opportunity to learn a new medium as well as to gain familiarity with what has just been learned. Campers may document what they have learned through sketchbooks, journals and digital photography. With nature as a constant with us throughout the week, campers will learn about the many natural materials that they may use to create individual and group-oriented artwork. Some of the natural materials include: grasses, leaves, twigs, moss and stones. Each day, campers will create one or more art items that will be carefully placed in a personal storage container during the week. At the end of the week, there will be a group art show for families and friends. The week will include regular camp activities as well - hiking, swimming, making new friends and having fun. 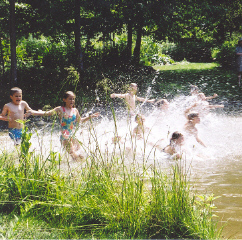 Overnight Camp includes all of the activities mentioned above in the description for Day Camp. On 3 days we either hike a mountain or canoe a river a short distance from the camp. We sometimes hike Belvidere Mountain or Jay Peak and canoe either the Missisquoi River or the Lamoille River. The longer days allow more time for rest and recreation; time to read a book, write in your journal or just visit with friends. Overnight Camp at the Bear Paw Pond base camp is an excellent way to prepare for bigger adventures in years ahead. Overnight campers stay in 2-person tents on tent platforms. Hearty, delicious meals are prepared by camp staff. 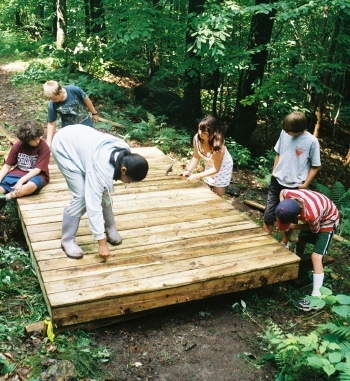 Campers gather each morning of Day Camp at the Trails Building next to the parking area at the Bear Paw Pond Area. 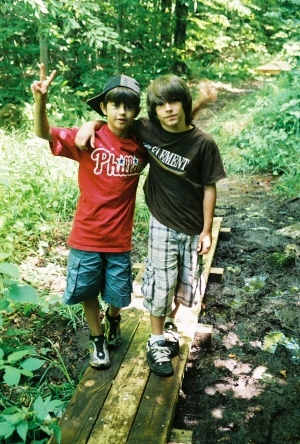 It's a short walk from the Trails Building each morning to Bear Paw Pond where most of the camp activities take place. 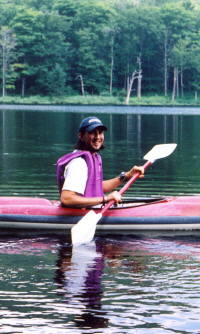 The Boat House is where we meet for canoeing and kayaking. This building is also used for Arts and Crafts. The Lean-to and the Dining Shelter are where we have snack and lunch during Day Camp and breakfast and supper in Overnight Camp. The Old Field Shed provides a permanent toilet, and 4 spaces to change in and out of swimsuits. At the High Ponds Farm, the Red Building has men's and women's bathrooms. This building also serves as shelter for campers in foul weather. At the Moosewood Ponds where we hike to for the Wetlands programs, there is a picnic shelter. We are proud of our staff and feel very fortunate to have such a dedicated group of people to guide the children through their camp experience. 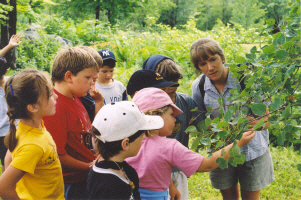 The HNA Summer Camp staff consists of enthusiastic and effective educators who have backgrounds in environmental studies, outdoor education, natural resources management and outdoor recreation. We look forward to having Josh Goodhue, Eliza Bradley, Cass Lantery, Isabel Li, Erica Li, Ruby Sartwell and Mia Falgiatano help with the 2018 HNA Summer Camp. Our staff members are our greatest asset. They are committed to providing a safe, supportive and fun learning environment for the campers. Their commitment to the environment and their compassion for young people have made a difference in the lives of the children who have come to Hazen's Notch. The HNA is very fortunate to have several camp alumni who each year volunteer their time and energy in support of the Summer Camp. If you have attended the HNA Summer Camp in the past and would like to volunteer some time this year, please contact us. You will earn the satisfaction of knowing that you are making an important contribution to a program that means a great deal to many young people. We're sure that it will be fun. It's also a good way to prepare yourself for possible employment with the HNA or a similar organization in the future.